This year, Pakistan celebrates the 71st year of Independence. 14th August 2018 will mark 71 years of freedom from the British rule, all thanks to our founders and rulers. It is a national holiday and every Pakistani love celebrating it with pride and enthusiasm. There are cultural events, ceremonies and flag hoisting too. The entire country is decorated with green props and flags to represent the Azadi and enhance the vibes. But, this is not it! One of the best parts about Independence Day especially for shopaholics is the Independence Day sale on different brands nationwide. You get to avail some amazing discounts, deals, and offers that help you save a lot. If you’re a tech-savvy person, the mobile phone is the first thing you’ll have your eye on. Whether you need an upgrade or you’re tired of your current phone or maybe you just need an extra one, Independence Day Sale 2018 will be the most perfect time to grab your desired phone at the best rates. Why Are Samsung Mobiles the Best? Samsung is one of the best smartphone brands in Pakistan and offers some innovative and high-tech pieces. Samsung smartphones have a set standard and it makes sure it delivers quality mobile phones with amazing specifications and features, excellent camera quality, amazing battery life, and great functionality. Moreover, the Samsung mobile phones prices in Pakistan are pretty much affordable for every Pakistani cell phone user. A roundup of the best 2018 Samsung phones will help you choose your new cell phone in a better and wiser manner. This phone is just flawless. It is gorgeous plus it offers premium specs and features. The body is sleek and the design is well-made. Even though it is pretty much similar to S9, this one has a notch. It is the best thing money can buy. It has additional features like the second rear camera. It is perfect if you can afford to buy it plus you’re okay with the size. 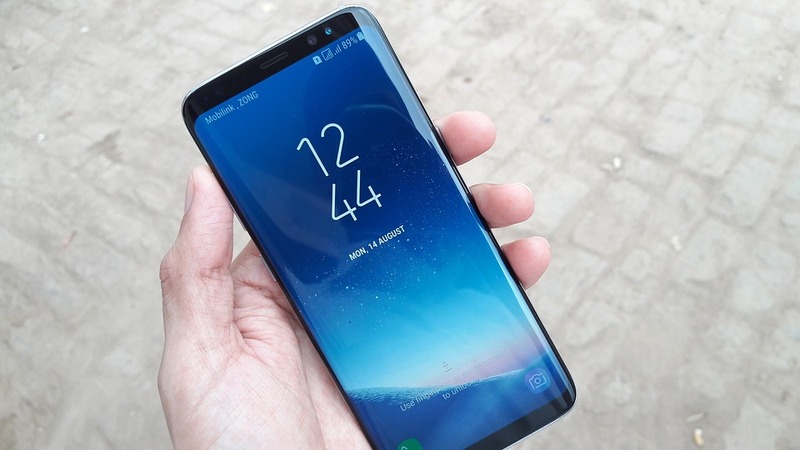 Samsung Galaxy S9 is known to be iPhone’s newest competitor and is the latest release among the range of Samsung phones too. Samsung S9 sports a 5.8 inches screen and quad HD+ resolution that is 2960 * 1440 px display. It has a 3000 mAh battery which gives an excellent battery life. The storage is also pretty good with 4GB of RAM and an eight-core processor with expandable memory. Samsung Galaxy S8 is not only amazing at its performance but also has some stunning looks. It is sleek with curved glass and aluminum shell. It has a 64 GB memory with 5.8 inches screen and a quad HD plus super AMOLED display. The resolution is 2960 * 1440 px. It has three biometric locks which allow you to unlock the phone with fingerprint impression, face recognition or iris scanner. These are a few reasons why it is considered as a high-tech phone. Samsung Galaxy Note 8 is like a mini movie theatre that fits right in your palms. It has an incredibly gorgeous big screen display which 6.3 inches and curved. It is dual edged and super AMOLED quad HD+ with 2960 * 1440 px resolution. It has a bang-on performance with a glass body. Looking for a mini version of Samsung Galaxy S8? Your answer is Galaxy A8. The design is flagship with amazing features and specs and most importantly it is cheaper than S8 a come in the mid-range category. It is great to go if you have a low budget but yet craves for the Samsung Label. Samsung has recently launched it’s much-awaited Galaxy Note flagship Samsung Galaxy Note 9. Astatically, Samsung Note 9 looks very much similar to the Samsung Note 8 and it took some design features from Samsung S8. Although, it’s considered as a modified copy of the previous Note 8 & with minor improvement in specs & features, and with the increase in price. But for sure Samsung would have added some additional punch into this Samsung Note 9. With this roundup of Samsung’s best phones of 2018, you can easily make a choice as per your requirement. Hold on to your horses and get ready to avail tremendous discounts, deals and offers through Azaadi Sale 2018 in Pakistan and make the most of it.